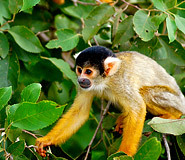 Discover Rurrenabaque during your price guaranteed Bolivia vacation. All of our Bolivia tours have daily departures and are fully customizable. 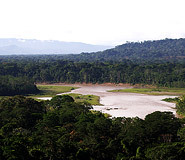 Rurrenabaque is situated on the banks of the Río Beni, approximately 250 miles (400 km) from La Paz. This small Amazonian town is popular for its proximity to the Bolivian Amazon and the pampas of Madidi National Park. The original people of the area, the Tacana, were one of the few lowland tribes that resisted Christianity and Western-style civilization. Today the town (called Rurre for short) remains small with just a few attractions, but is surrounded by lush hills and fully equipped to serve as a base for travelers heading out to the Amazon. Rurre’s relaxed atmosphere makes it the perfect place to unwind after returning from a jungle tour or wildlife-viewing excursion. Rurrenabaque is particularly appreciated among wildlife lovers: the town is located at the confluence of the Andes, the Amazon, and the wetlands, producing a unique mix of flora and fauna found nowhere else on earth. Walk around town. Although most people use Rurrenabaque as a staging ground for further excursions, there are several worthwhile places to visit in and around town. A hike up to La Cruz (the cross) in the southeastern part of town offers great views of the Rurre and Beni rivers; zipline canopy tours give guests an exhilarating trip through the treetops; and the town of El Chorro, a few miles outside of town, has a lovely waterfall. Explore the Amazon. This jungle town is a major launching point for Bolivia Amazon tours into the surrounding spectacular virgin rainforests, as Rurrenabaque sits just outside Parque Nacional Madidi. Most tours begin on a riverboat heading up the Beni or Tuichi rivers. Discover the pampas. A visit to the savanna wetlands outside of Rurrenabaque is one of the best ways to see wild animals. Keep an eye out for macaws, anacondas, and monkeys. A special treat is spotting the pink river dolphins that live in the dark brown waters. 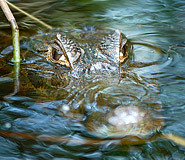 Many of these creatures live in the jungle as well, but those that live in the openness of the pampas are easier to spot. Rurrenabaque is always hot and humid. The rainy season (summer) extends from November until March. Visitors are advised to avoid booking travel to Rurrenabaque during this time because there are more mosquitoes, there is an increased chance of flooding, and travel is generally more difficulty due to heavy rains, mud, poor road conditions. There is also a higher chance for delayed or cancelled flights. At all other times of year, temperatures are slightly cooler, rain is less likely, and bodies of water shrink, making it easier to spot wildlife in the pampas. Thank you for an excellently organized trip to Peru and Bolivia. The Bolivian experience including Lake Titicaca, and tortora boat visit to Tiwanaku ruins was a different (high altitude!) experience. The unforgettable decent from high Regal Cordilleras and the La Cumbre Pass (4,650 meters a.s.l.) to a steamy Yungas tropical rain forest at only 1,500 meters a.s.l. and a visit to small town of Coroico was very interesting. All in all, the itinerary was followed closely and punctually and all local tour guides were very professional and informative. Tourist accommodations have flourished in the last decade; there are some good 3-star hotels, one 4-star hotel, and many basic hotels. However, there are no 5-star hotel options in Rurrenabaque. Contact your travel advisor for more information.